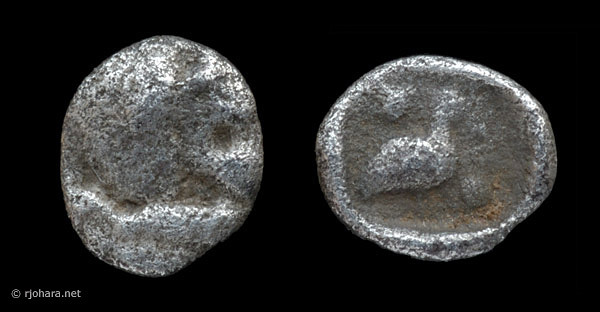 Many of the smaller stater fractions from the Archaic and Classical periods are so tiny that their types can be difficult to determine if the coin is worn, although the weights of these tiny fractions continue to be extremely precise. (Doug Smith has written an excellent page reviewing the many types of Greek fractional silver.) One well-known fractional series that is commonly attributed to Miletus features a roaring lion head on the obverse, and on the reverse a standing bird, variously identified as a quail or a bustard. One or two pellets often appear in the corners above and below the bird. It has been suggested that the pellets indicate the coin’s denomination, but no consistent pattern in the number of pellets can be detected. The rendering of the lion’s head and foreleg on Nos. 1045–1046 is very similar, indicating a common origin for the issues despite the difference in reverse type. [1045 shows a bird standing right with two pellets; 1046 shows a bird standing left with no pellets.] The bird of No. 1046 seems definitely to be a quail but there is less certainty about that of No. 1045. In a Münzen und Medaillen list (No. 196, January 1960, 18) the type is described as a dove and the coinage is attributed to Miletus. It seems to me that the representation may be a peacock with Samos as a possible mint, but Alfred Bellinger feels that it is almost certainly a bustard. Note: Koray Konuk has recently proposed in SNG Kayhan that these issues are not Milesian but may instead belong to Mylasa, the principal city of ancient Caria, about 35 miles southeast of Miletus (Konuk, 2002: #940–948). The details of his argument will be published shortly. He dates them to about 420–390 BC. These coins seem to have been issued in two denominations—forty-eighth staters and ninety-sixth staters—but all of the published sources I have examined refer only to forty-eighth staters. Many combinations of obverse and reverse exist with respect to the direction the lion and bird are facing, and with respect to the number of reverse pellets, but I have not been able to detect any pattern in this variation. As in the early Milesian twelfth staters, the obverse type of these coins is, strictly speaking, a lion protome with foreleg visible and head reverted, rather than a simple lion head. Several of the specimens below, such as RJO 34 and RJO 46, show this clearly. For convenience, however, I have grouped the specimens in this collection into those with the head facing right and those with the head facing left, since that is the most obvious feature of the coin in most cases. RJO 8. 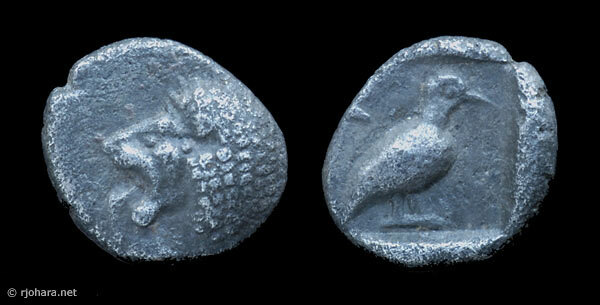 Silver 1/48 stater (0.28 g), 525–500 BC. Obverse: lion’s head right. Reverse: bird standing right with two pellets. RJO 33. Silver 1/48 stater (0.31 g), 525–500 BC. Obverse: lion’s head right. Reverse: bird standing left with two pellets. RJO 34. 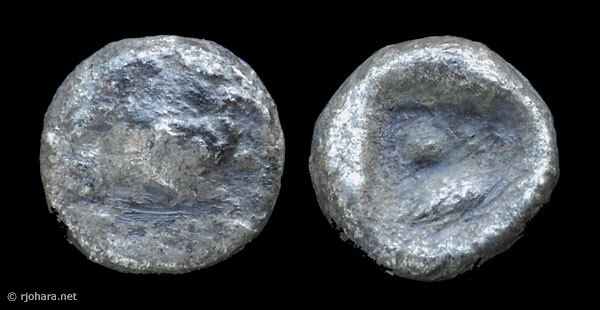 Silver 1/48 stater (0.25 g), 525–500 BC. Obverse: lion’s head right. Reverse: bird standing right with two pellets. RJO 46. 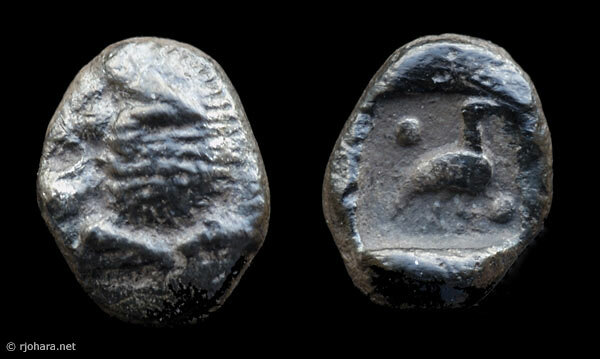 Silver 1/48 stater (0.28 g), 525–500 BC. Obverse: lion’s head right. Reverse: bird standing right with two pellets. RJO 68. 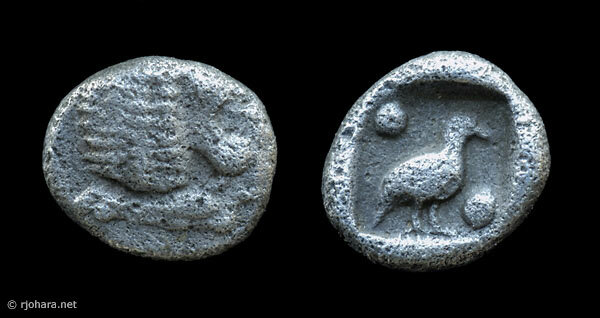 Silver 1/48 stater (0.25 g), 525–500 BC. Obverse: lion’s head right. Reverse: bird standing right with two pellets. RJO 12. 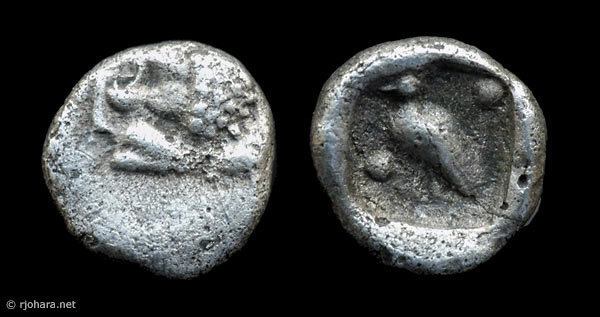 Silver 1/48 stater (0.25 g), 525–500 BC. Obverse: lion’s head left. Reverse: bird standing right with no pellets (possible indication of one pellet over bird’s back, but if so it is mostly off the flan). RJO 18. 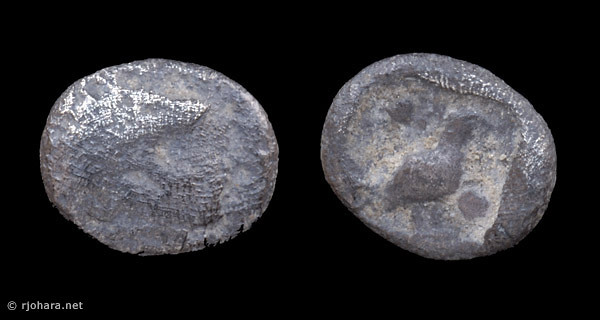 Silver 1/48 stater (0.23 g), 525–500 BC. Obverse: lion’s head left. Reverse: bird standing left with no pellets. RJO 29. 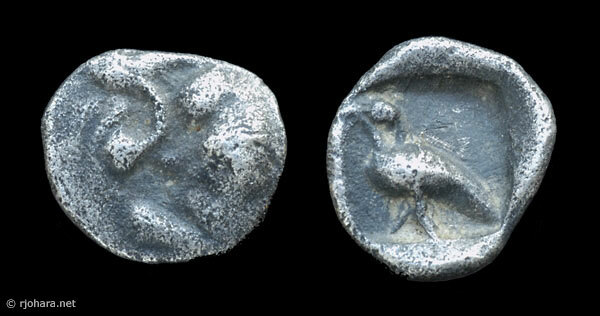 Silver 1/48 stater (0.24 g), 525–500 BC. Obverse: lion’s head left. Reverse: bird standing right with two pellets. RJO 31. 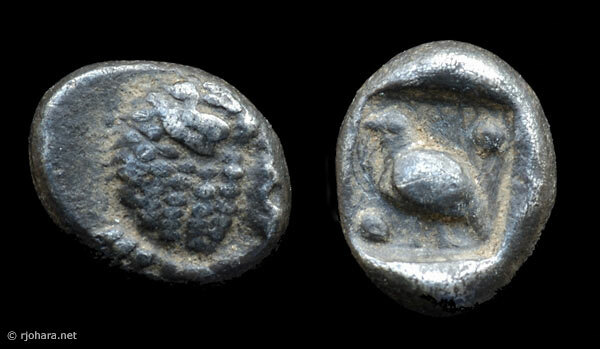 Silver 1/48 stater (0.26 g), 525–500 BC. Obverse: lion’s head left. Reverse: bird standing right with two pellets. This specimen is a fine example of intergranular or reticulate corrosion, which may be an indicator of a high degree of purity in the original silver. In these specimens the direction the obverse lion is facing cannot be determined. RJO 7. Silver 1/48 stater (0.29 g), 525–500 BC. Obverse: probably lion’s head, but too worn to be certain. Reverse: bird standing right with one pellet over its back; the strike is off-center so it isn’t possible to tell if there was a second pellet under the bird. RJO 77. Silver 1/96 stater (0.16 g), 525–500 BC. Obverse: lion’s head right. Reverse: bird standing right with two pellets. RJO 15. Silver 1/96 stater (0.17 g), 525–500 BC. Obverse: lion’s head left. Reverse: bird standing left with no pellets. RJO 26. Silver 1/96 stater (0.14 g), 525–500 BC. Obverse: lion’s head left. Reverse: bird standing left with no pellets. RJO 32. 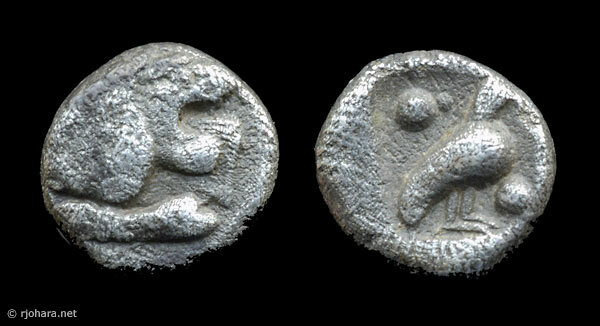 Silver 1/96 stater (0.14 g), 525–500 BC. Obverse: lion’s head left. Reverse: bird standing left with two pellets.